So today I'm wondering why it is that the spare tire, up under my X-TERRA, has to be installed with the air valve stem up where you can't get at it. Also why the rubber stowage dust cover works better holding dust in than out. Having along three cans of, "Fix-A-Flat," and two kits of tire repair plugs with rubber cement, a 12V tire air-compressor, plus a good spare, may sound like over-kill but we still were short of stuff sufficient to rescue ourselves and still have a back up plan for the trip back to civilization. After driving to the west coast for last year's Otto at Dockweiler meet I was thinking of visiting Bill and friends in New Mexico. Unfortunately the detour was a bit too long and I wasn't able to make it. But in reading this account about Little Florida Mt. it could be that it was better that I didn't pay a visit! At some point, if I get the chance, I'd love to fly at one or more of your local New Mexico flying sites. And here's to hoping you all avoid similar transport mishaps in the future! wingspan33 wrote: At some point, if I get the chance, I'd love to fly at one or more of your local New Mexico flying sites. 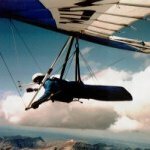 Every time I visit one of our US Hawks chapters or members, it reminds me of what the sport of hang gliding should be like. Thanks to each of you for keeping the sport - and the spirit - of hang gliding alive!!! That was a heck of a launch, Bill. Some good flying yesterday! Bill Cummings and I went out for another adventure today at the Little Floridas. All went according to plan, with a forecast for west winds about 12 mph by late afternoon. All until I actually launched at 4:06 pm MDT. Where's the lift? I really couldn't find anything to work, despite many dustdevils in the region and a lot of building cumulus (and cumulo nimbus) clouds all around. Within 4 minutes I was on the ground, a good landing into a strong north wind. (Yes, north. So much for forecasts...) Bill and I had the glider on the X-Terra and were headed for home by 5:30 pm, when we noticed just how dark and threatening everything in the sky was getting. We paused 20 minutes at Akela Flats, on the way back to Las Cruces, just to avoid a brownout; a massive dust storm, the result of outfall from the thunderstorms, looked like a fine phenomenon to avoid. But all was still dry in Las Cruces when we arrived about 7:00 pm. It was a pretty long trip for a sled ride, but nice to be in the air again - and to be on the ground before the downpours hit. Yesterday, Saturday November 17, 2018, Sam and I (Bill) helped Juan with an Assisted Windy Cliff Launch (AWCL). with the top of the Big Florida Mountains, SSW of the Little Florida Mountains. This launch site is a non regulated site open to flyers with the equivalent experience of a H2 skill rated pilot. still would not have lasted long enough to video the landing.